It’s sunny and warm in the city, so if you want to spend the weekend in a winter wonderland, the mountains, just a short drive away, are calling. The first snow of the season fell before Thanksgiving in Big Bear, leaving a powdery landscape of snow flecked pines and snowcapped rooftops. If you need a charming homebase for skiing or sledding or if you just want to spend a cozy 48 hours nestled by a warm fireplace, below are eight cabins in Big Bear, Idyllwild, Lake Arrowhead, and Wrightwood all available for rent on Airbnb, VRBO, or Homeaway. ↑ This one-bedroom cabin in Wrightwood boasts a modern kitchen with stainless steel appliances, but with its wood beams and wood paneling and fur throws retains a cozy vibe. It’s a half-mile walk to the shops, bars, and restaurants in Wrightwood Village. The nightly rate is $126. ↑ This bright and spacious four-bedroomin Lake Arrowhead is looking chic with its aztec prints and white paint. The galley kitchen flows into a roomy living room, which features floor-to-ceiling windows that look out to a thicket of pines. On the weekends, it rents for $626 per night. ↑ Renting for $145 nightly on weekends is this little sage-green cabin in Lake Arrowhead with a brick fireplace and a small loft. Built in 1920, it was originally used as housing for Forest Service employees. It looks like it might have original hardwood floors, while the rest of the well-kept space is updated but still a bit rustic. 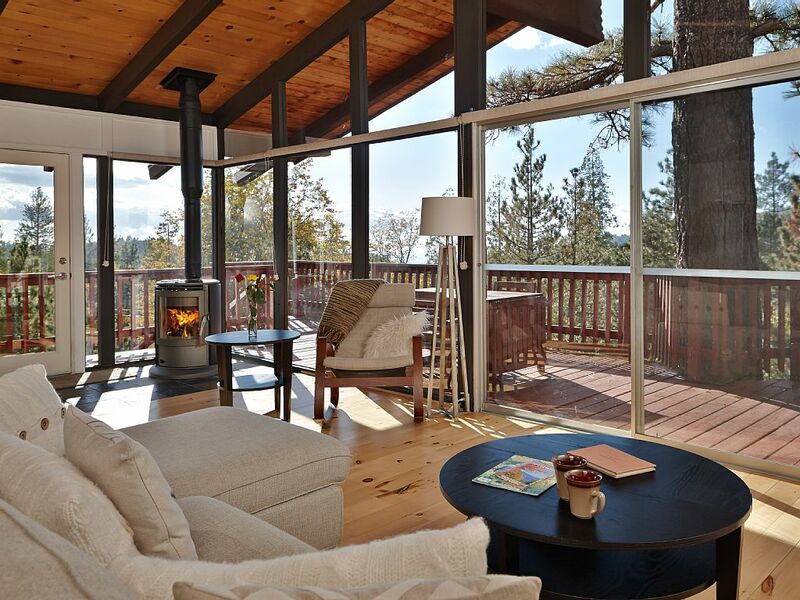 ↑ “This isn’t your Aunt Sally’s stuffy cabin,” the listing copy says. Agreed. It’s more like your hipster brother Chet-with-a-mustache’s retro-inspired cabin. It’s filled with midcentury modern-inspired furniture, and it looks pretty sweet. The weekend rate for the two-bedroom home with a stone fireplace is $140 nightly. 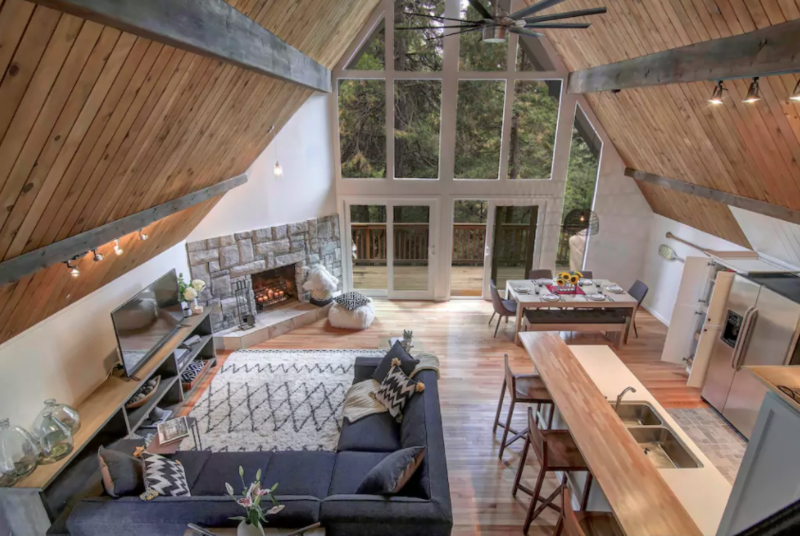 ↑ Floor-to-ceiling windows flood this stylish and spacious remodeled cabin in Idyllwild with light and provide “an intimate connection to the outdoors” for $375 per night on weekends. It features three bedrooms and a hot tub on its wraparound deck. ↑ If you’re looking for a log cabin with kitsch, this is the place for you; the one-bedroom is filled with plaid and moose decor and fur rugs. It’s located in Big Bear, and the listing copy says it’s right across from the National Forest. The nightly rate is $143. ↑ Here’s a three-bedroom post and beam located, once again, in Big Bear. The cabin’s sleek living room—with its towering plaster fire place and red sectional—is unexpected, and its two bathrooms have been fashionably updated. It rents from $400 nightly.